I got a chance to borrow a bicycle for few weeks. 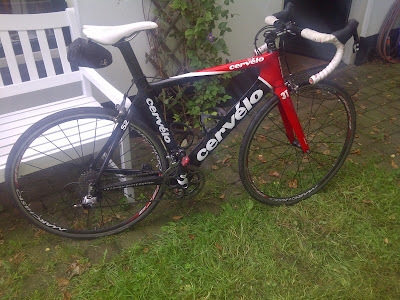 And not just any bicycle, but a real road racing bike (sounds even cooler than what it really is :-). Besides hockey, biking really fast through the streets of the Netherlands with very tight outfits is one of the national sports here. I have so far only experienced the slow rolling with my hippie bike. Putting on full biking gear including click-to pedals was somewhat scary. The first time we practiced in our front yard multiple times clicking off-clicking on-clicking off and me getting more scared by the minute. It took quite some persuasion to make the next step and get out to our street. And I definitely did not want to go there while the neighbors' kids were playing out. Probably all the dutch kids here spend 50% of their waking up time on bike, so I was planning not to go there to humiliate myself, or even worse, get instructions from 7-year-olds :) In the late hours of the day I did some circles on the street and actually the faster I went, the easier it got! After that, we did few biking trips around ~40 kms in the surroundings of Utrecht. It was nice to see the country from a different perspective, while going through country side, forests and hills (yes, we found even those in these flat lands..!). I was convinced that I need to get me a bike also and add it as not only exercising routine but also a way to see enjoy the outdoors and maybe improve my navigation skills. My goal is to train enough so that I could participate on a bike riding event for girls, one being mid-September in Den Bosch the distance being either 35 or 69 km. First step is then to shop a bike for me. Next week we are going to visit the Bianchi store to see what kind of bike would be good one. My selection is at the moment based solely on color & looks, but somehow my selection of the nicest bike also seems to be the most expensive one..